WHAT IS TRUTH BUT COMPROMISE? 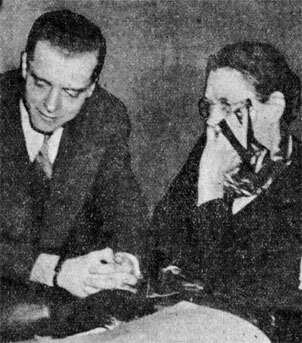 In a surprising turn of events, Lucy Sarber was giving props to Harry Pierpont just a day or so before he was sent to the electric chair for the murder of her husband, Jess Sarber. The compliment was in response to his attempts to address a nasty rumor that had started almost a year before. The rumor? Although details varied, basically it went along these lines. Sheriff Jess Sarber had accepted money to allow John Dillinger to escape. This escape was supposed to have taken place during Dillinger’s transfer from Dayton to the Allen County jail in Lima, Ohio. When Sarber failed to make good, he was killed for the alleged double-cross two weeks later. It didn’t make sense to many in Lima that Jess Sarber had sent just his young son, Don and Don’s college buddy Herbert Liang along with Julius Callahan, the Allen County probation officer to pick John Dillinger up in Dayton instead of going himself. Dayton authorities agreed. Appalled by Sarber’s lack of caution, they refused to let the group leave with Dillinger until Jess Sarber agreed to meet them in Piqua which is about halfway between Dayton and Lima. Why the trepidation? Dayton police were afraid an attempt might be made to free John Dillinger because several suspicious characters had been seen loitering around their jail. They had good reason to be cautious. The escape from Michigan City prison by ten of Dillinger’s acquaintances had occurred just a day or two prior to the transfer. John Dillinger was suspected of helping with the break-out. Evidence had been found on his person when arrested that indicated Dillinger was directly involved. After a heated phone call between Dayton and Lima, a compromise was reached. Jess Sarber, along with the Lima Police Chief and four other officers hustled down to meet the group at the halfway point and escorted them back to Lima with no further incident. But by then the damage was done. Several reporters had gotten wind of the story. It made the front page of the September 28th 1933 issue of the Lima News. Some found it hard to believe that Jess Sarber would be so careless. People became suspicious when they read the words of Deputy Wilbur Sharp, one of two eyewitnesses who testified at the murder trials of Jess Sarber. Still in a state of shock, Sharp had given an interview within hours after the attack. It appeared the next day (October 13, 1933) in the Lima News. Fairly straightforward, his description of events is an interesting read for several reasons, some obvious, others more circumspect. This was the question asked a dozen times at the scene of one of Allen-Co’s major tragedies, as the minutes rolled on towards midnight Thursday ~ after a manhunt. And the question burned brightest in the mind of the loyal deputy who stood by, helpless-with four pistols leveled at his breast-as the chief law enforcement officer of the county was shot down ruthlessly. The deputy sheriff is W.L. Sharp. The gunman is believed to be Harry Pierpont, one of 10 convicts who recently escaped from Indiana state prison at Michigan City. “If I could have done anything to save Jess’s life, I would have done it.” Sharp said in quivering tones to a reporter, after he had returned with city and county officials, who had searched thru five counties in an effort to capture the slayers. By the time Harry Pierpont, Charles Makley and Russell Clark arrived back in Lima, Ohio to stand trial for murder, stories about Sarber’s “double-cross” were flying around town. Sharp’s statement “It looked like he was a marked man,” seemed proof to many that Jess Sarber had been on the take. And although the general public often has a short attention span, folks compared what Wilbur Sharp had said in that interview to his testimony at the murder trials. Originally, Sharp asserted that the “big man” had been the only one to shoot and strike Sheriff Jess Sarber. During his testimony, five months later, Sharp changed his tune, now accusing a second man, Charles Makley, also of assaulting the sheriff. At some point Wilbur Sharp had not told the truth. Rumors spread that his contradictions were a cover up for Jess Sarber’s indiscretions. The gossip picked up a head of steam and kept on percolating throughout that long summer. It didn’t help matters when newspapers asked Don Sarber what he thought about John Dillinger being killed in Chicago. “He deserved it. He got what was coming to him,” Sarber declared in the caption of a photo taken while standing next to the back of a car with the slogan Vote Sarber for Sheriff. Evidently not everyone agreed with his views because Don was defeated in the sheriff election three months later. In desperation, it was finally decided to consult Harry Pierpont while there was still time. By special permission, he was interviewed by the editor of the Lima News on death row. However the clock was ticking. Only ten minutes was allotted for the questions and answers. Pierpont was smart enough to appreciate the obvious conundrum his words presented. If you believed what he said about Jess Sarber not being murdered for a double-cross then you should also believe him when he said that he was not the killer. It wasn’t exactly the statement, the Lima News had been after so the editor pursued the matter a bit further by asking if Pierpont had ever heard John Dillinger speak about Jess Sarber entering into a deal that he had reneged on. Pierpont firmly denied hearing anything of the sort. “What would you do?” Pierpont snapped back. “I never have been thru what you have,” the editor replied. Suspect In Raids In Three States Brought To City Under Strong Guard. September 28, 1933, The Lima News, Lima, Ohio. Jail Delivery Executed By Pen Fugitives; Lock Deputy and Sheriff’s Wife in Cell. October 13, 1933, Wapakoneta Daily News, Wapakoneta, Ohio. Raid On County Jail Described By Deputy. October 13, 1933, The Lima News, Lima, Ohio. Identify Second Killer In Death Of Lima Sheriff, October 14, 1933, Wapakoneta Daily News, Wapakoneta, Ohio. ‘He Deserved It,’ Says Sarber, July 23, 1934, Mansfield News, Mansfield, Ohio. Dillinger Trigger Man There Was No Double Cross - Harry Pierpont Clears Name of Jess L. Sarber, October 16, 1934, The Lima News, Lima, Ohio. Harry and Lena Pierpont, The Ohio State Journal, October 17, 1934, Columbus, Ohio. Harry Pierpont Must Die News Headline, The Lima News, September 26, 1934, Lima, Ohio. Don Sarber, 1927 Senior High School Picture, Author's Collection. Michigan City Indiana State Prison, Author’s Collection. Ohio Map, 1919, Author’s Collection. “Sarber for Sheriff”, August 1933, Author’s Collection. Harry Pierpont, The Ohio State Journal, October 17, 1934, Columbus, Ohio.